Smart Home Security give you the ability to control your alarm on the move wherever you go. Get instant alerts, arm your system on the go, and always be in control. All in one App for total control. A Smart Thermostat in your home can help save the average homeowner save up to 20% on their energy bills. This is one of the most popular features that Citywide Alarms customers benefit from in their home security. The smart garage door control feature notifies you if the garage door is left open. It uses Geo-Fencing technology to alert the homeowner so that you can completely secure your home. Smartest Home Control gives you the ability to have an extra layer of home security along with many home automation features. Never forget to lock the doors again with our Smart Door Locks. This product gives the homeowner the highest levels of home security with the newest home automation features. Citywide Alarms Video Monitoring solution allows you to view live streaming video remotely using any smartphone, tablet or computer. You will be notified if there is any motion detected in or around your home. Smart Home Security gives you the ability to control your alarm on the move wherever you go. Get instant alerts, arm your system on the go, and always be in control. All in one App for total control. Smart Thermostat in your home can help save the average homeowner save up to 20% on their energy bills. This is one of the most popular features that Citywide Alarms customers benefit from in their home security. Company In St. Louis, MO! Whether you’re a renter, homeowner or small business owner, Citywide Alarms has the perfect solution to suit all of your needs. Who says you can’t have sophisticated home security equipment for an amazing price? Contact us today for a free estimate! WHAT SEPARATES CITYWIDE ALARMS FROM HOME SECURITY COMPANIES IN ST LOUIS MO? Citywide Alarms is best known as the top rated home security company in St Louis, MO. We are committed to providing a more powerful and safer home, keeping us on the cutting-edge of our industry. We use products like Smart Garage Door Modules, Video Doorbells, Infrared Cameras and Touch Screen Alarm Panels. With over 7 years of alarm and home security experience, we constantly seek out new opportunities to expand our services to meet these new customer demands. Smart Home Alarm Systems and Smart Home Automation Systems are more advanced now than ever. 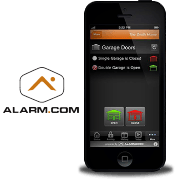 You are able to control your entire home through a single app for easier control and maximum security protection. Our goal at Citywide Alarms is to meet and exceed any new home or business security challenge. We pride ourselves in offering incredible service during installation and throughout the years that we protect your home. Always know who is at your door with our new video doorbell. Another layer of home security protection to prevent burglaries from occurring. Save monthly on your energy bills with this integrated technology. Choose an option below based on your current needs. We’ll help you find the perfect solution! Don’t wait, get started today! No matter what type of security system you need, Citywide Alarms is here to help.